Peter Paul CachiaOSA: Spirituality, Devotions & Traditions of the Augustinian Friars in Gozo. The name of Augustinian monk Fr Peter Paul Cachia of Victoria is gradually becoming synonymous with the history of the Augustinian Order in the Maltese islands. The Augustinians arrived in Malta in 1413 but, before 1453, they already had a priory on the island of Gozo. After publishing a book about the history of the priory and Augustinian church of Victoria, Cachia has now delved deeper into the history of the same priory and provided us with a detailed sketch of the various spiritualties, devotions and traditions of the Gozitan Augustinians. The first part of the book focuses on the different characteristics of the Augustinian spirituality as they evolved in time on the island of three hills. The arrival of the monks in the middle of the 15th century must have been quite an event for the Christian community of the island. Gozo, suffering from the phenomenon of what has now been coined as double-insularity, always played a secondary role in the history of the archipelago. However, there were exceptions to this rule. The discovery of the ancient poem Tristia ex Melitogaudo and its translation into English and eventual publication is a proof of this. Gozo must have maintained the Christian faith even during the Arab rule. Now, in the mid-15th century, Gozo was embracing the first Catholic religious order ever to arrive on the islands. Being part of the Kingdom of Aragon through their connection with Aragonese Sicily, at this point in time the Maltese Islands had been consolidated once again in their Christian inheritance. The coming of the Augustinians served to enrich the Christian heritage of the tiny island of Gozo, an island which was very much a backwater and was to remain so under the Knights of St John. Within this historical milieu, the Christian community of Gozo must have been overjoyed to witness the arrival of a religious order with such an enriching history. The Augustinians came from Sicily since Malta formed part of the Sicilian province. The very fact that these monks envisaged a living on the small island is a proof in itself of a vibrant religious community on Gozo. Having mentioned the Order of St John, it is vital to mention at this point that Fra Bartolomeo Bonavia was the Augustinian monk who served as an intermediary between the Knights and the Ottoman Pasha when the Turks attacked Gozo in what is now known as the Great Siege of Gozo of 1551. The second part of the book studies the characteristics of the Augustinian devotions and their traditions. Devotion to the Blessed Virgin Mary the Mother of God under the title of ‘Our Mother of Consolation’, known in Latin as Mater Boni Consilii, can be considered as one of the major characteristics of the Augustinian presence on the island. Various paintings, statues and artefacts carrying this particular Marian title are studied in detail in Cachia’s book. One cannot be far from the truth if he were to say that in the same manner that the Franciscans promoted devotion to the Immaculate Conception and the Carmelites brought forward the devotion to Our Lady of Carmel, the Augustinians focused on Mary as the fountain of consolation and considered her their rightful protector. Cachia provides ample information about the various statues that adorn the church and priory of St Augustine of Victoria. Among these, I would like to mention the statue of St Monica sculpted by Agostino Camilleri in 1924, the statue of Augustine also made in papier-mâché by the same Camilleri together with the statues of St Nicholas of Tolentine made in wood by an unknown artist that goes back to 1738 and another statue of St Nicholas of Tolentine made in papier-mâché by Agostino Camilleri in 1913. Since devotion to St Rita of Cascia is the prerogative of the Augustinians, I cannot fail to mention the statue of St Rita that Agostino Camilleri sculpted in 1916 and which still attracts many devotees especially on her feast day in May. The third and last part of the book focuses on other Augustinian traditions that were not tackled in the previous two chapters; this part takes into consideration the ex-voto that are to be found in the priory. Fr Peter Paul’s latest publication is the ideal source-book for all those who want to become friendly with the Augustinian presence in Gozo. The book is enriched by the beautiful photographs taken by young Gozitan photographer Anthony Grech; the photographs bring to life the artistic treasures by which the priory is endowed. Young art critic and researcher Paul Cassar gave his input from the artistic point of view. It was he who discovered documentation stating that Mattia Preti was the painter of the main altarpiece depicting the saintly bishop of Hippo. 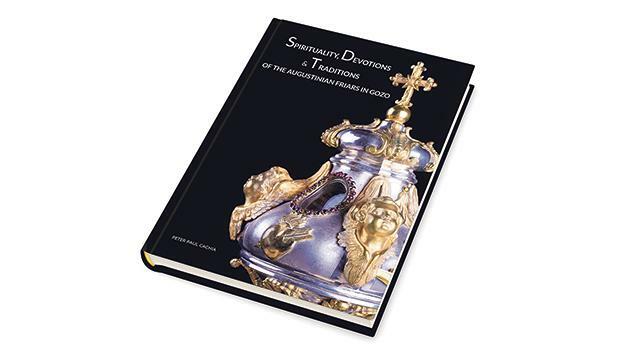 The last section of the book features the various objets d’art, paintings and statues that past priors, monks and benefactors commissioned throughout the ages. Spirituality, Devotions & Traditions of the Augustinian Friars in Gozo, which I consider as the magnum opus of Fr Peter Paul Cachia OSA, is a celebration of the Augustinians’ cultural, artistic and religious heritage on the island of Gozo, a heritage which is to be enjoyed and appreciated by one and all.